India has been a great nation since ages. The reason for this is our rich culture and ethics. India is the Country which has welcomed and honoured civilizations irrespective of caste, religion and creed. Our nation is the best example of “UNITY IN DIVERSITY” for the entire world and human kind. This inherited characteristic results in acceptance of Indians in all the nations throughout the globe. India is a land of vast culture and uncountable languages which changes its flavour every Fifty Kilometres. Yet, Hindi and Urdu are the two languages which can express the Indian culture and literature to a larger extent. We are proud inheritors of great thinkers, philosopher, scientist and intellectuals, who have served the entire mankind during their life and after. Their foresight and vision has led the nation towards progress and prosperity. One such Indian thought eight years ago “What a pleasant moment it would be if he can form a platform to exhibit Indian Culture through a poetic Indian Republic Day Celebration in UAE.” The thought itself was special and unique. Any Indian may have this wish but the uniqueness of Mr. Syed Salahuddin was that he dedicated himself for his dreams. With much selected companions he started and led the entire team in a fanatical, devoted and patriotic manner. Mr. Salahuddin along with his team has organized eight Kavi Sammelan Mushaira till date. The event is the Republic Day Celebration of India in an International Trade Centre and is very famous among all Indians and poetry loving people of U.A.E. Al the members of the organizing committee are committed for their language, nation and Indian Culture. As Chief Organizer, Mr. Syed Salahuddin has influenced the entire team to develop this partisanship. It requires great management, team work and vision to organize such an event. And Mr. Syed Salahuddin has proved that INDIA still produces thinkers and philosophers. It is his effort which has resulted in first ever celebration of Indian Republic Day outside India and that’s history. Mr. Syed Salahuddin and his committee are thankful to U.A.E. Government for all their supports and encouragement extended to Indians for organizing this annual event. We are thankful to authorities for the inclusion of this celebration as an Official DSF event. The organizing committee is thankful to all Indian for their co-operation and encouragement to deliver a literary night which ends by the announcement of the next celebration of Indian Republic Day i.e. next Kavi Sammelan Mushaira. Poetry is that genre of literature which cascades down to the inner core of the heart effortlessly and is capable of bringing about sea changes in human psyche. Poetry is at its best when recited live before the audiences that is why Mushaira and Kavi Sammelan together were chosen to be organized annually and that too on the eve of 26th January the republic day of India when the constitution was adopted whose preamble itself envisages secular credentials inter-alia. The bottom line of organizing such an event is simply to promote the cause of Urdu and Hindi languages over-seas, to bring people irrespective of cast creed and religion together imbued with nationalism, secularism, harmony and peace as well as to present glimpses of Indian ethos world over through the extensive coverage imparted by electronic media. Despite teething troubles it has come a long way and the missionary zeal of people associated with the event has succeeded to a great extent if not to the hilt. The auditorium full to the capacity decked with flowers and flags epitomize the Indian unity in diversity. Poets getting enthusiastic encore from the audience is the testimony of the immense pleasure they derive. Spell-bound and enthralled by Urdu and Hindi couplets people remember it for the rest of the year in the context of 26th January to come again. The sole motivation behind the event is to give fillip to Urdu and Hindi languages at international level and o enthuse people with the feelings of peace and sanity, love and brotherhood. 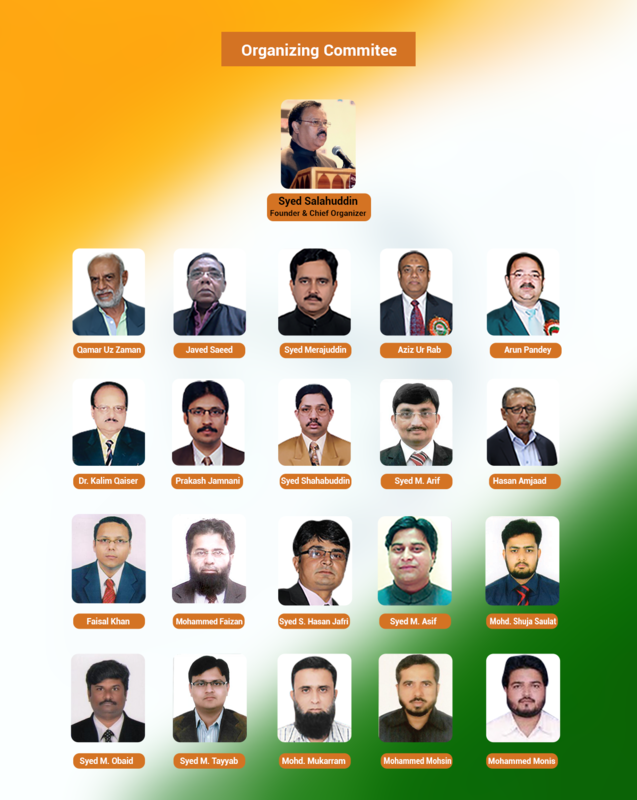 The purpose is being served massively because of the overwhelming support from the international community particularly from the Gulf, as a result of which, in the pantheon of Mushaira and Kavisammelans overseas it has already occupied the highest pedestal. But it is a relentless pursuit. May God help us to persist with this endeavor. India is a land of vast culture and uncountable languages which changes its flavour every Fifty Kilometres. DUBAI — To celebrate the Indian Republic Day.. Please enter your contact inrormation below to subscribe to our mallling list.